Chinese investment in neighbouring Laos has locals worried that the rubber plantations and casinos it is setting up are damaging their way of life. The croupier pings the bell to bring to an end the flurry of Chinese banknotes being flung onto the baccarat table. Everyone is backing one man in particular who has been on a winning streak. The croupier deals two cards and then reveals what the man has to beat - the nine of clubs. All attention turns back to the man, who turns over the other card and then slams it down onto the felt with a flourish. Everybody cheers - he has won and so they have, too. This casino is one of several in the town of Boten, where guests are greeted with a deferential "ni hao", "hello" in Mandarin Chinese. What is remarkable is that this casino is not in China, where gambling is strictly forbidden, but across the border in neighbouring Laos. Investors have leased the whole town and its surroundings from the Lao government for 60 years. 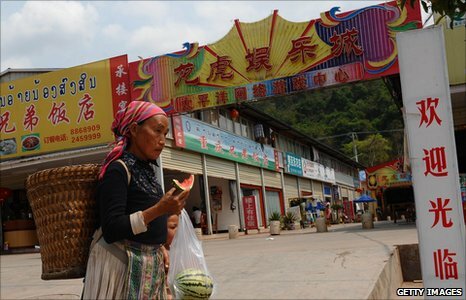 In Boten, the road signs are all in Chinese, staff in the hotels speak Mandarin, and the town's main strip is a line of food stalls selling dumplings and fried duck, outside which young Chinese prostitutes parade up and down until all hours of the night. I meet Robert, a security guard who works in the casino, having a crafty cigarette break outside. "This used to be just a rubbish Lao village," Robert tells me. "They gave each of the villagers around $800 (£488) and told them to get out of here. "Since then it's basically a Chinese town." And Chinese investments in Northern Laos go a lot further than Boten's casinos. Several Chinese rubber companies have begun to build offices in nearby Luang Namtha. Just over the border, China's Yunnan province is a booming centre of the global rubber processing industry, producing rubber for everything from car tyres to condoms. But with no room left to plant more trees there, Chinese companies are having to look further afield. The Lao government believes it has spotted an opportunity. Gambling that Chinese rubber money could open a fast track to development in the region, it has offered generous incentives in the form of tax breaks and land concessions. Ban Chagnee is a Lao village in one of those concessions. I arrive in the village in the middle of a particularly torrential downpour, and a thin young man with a long, drawn face called Borsai invites me in to shelter from the rain. While his chickens cluck loudly in the backyard, Borsai squats on the floor and pours us both a glass of whisky. "Four years ago," he says, sliding the glass towards me, "the military came and told us the government had sold our land. Anyone who tried to grow rice there again would be arrested." The army offered poor compensation. "They paid me 15 pence for every day's work I had done," he says. "Nothing for the rice, let alone for the land." The Lao government argues that the strategy of trading villagers' land in exchange for jobs is necessary to benefit the country as a whole. But Borsai says only the politicians and the generals profit through backhanders and corruption. "We prefer the old way of life," says Borsai. "Yes, we can make money if we work for the Chinese, but our expenses are higher. "We should spend money on rice but instead we spend it on phonecards and alcohol." Heaven help him when the casinos and prostitutes arrive. It is not only Chinese companies that can grow rubber in Laos. Fifty miles (80.4km) down the road, Han Yuang boldly tells me that he was in fact the first man in Laos to plant rubber 14 years ago. Han is now in his 60s. He learned the skills needed to grow rubber during the time he was exiled in China after the Vietnam war. Now back in Laos, he and his sons farm 50 acres of rubber that will produce a very good income this year. He shared his knowledge freely so that now every family in the village is benefiting from rubber. "We're not rich here," says Han as he smiles with his two remaining teeth. "Let's just say we have enough." But Han is not happy with everything that he sees. "I worry about all the Chinese companies coming into Laos," he says. "How will they find enough people to work all those trees?" A rubber plantation requires three or four people per acre to maintain it once in full production. Add up all the land ceded to Chinese companies already, and that means over a million people are going to be needed. "Are they planning to bring a million Chinese here to Laos?" asks Han. "What will that do to our culture?" A universal plug socket... at last?